As rapid changes in some kinds of industries, especially in auto industry, the faster business men launch their new product the more markets they seize. Since the high competition, a short time demand of a reality product launched from a draft design is pretty high. In this situation, we received the order from a famous automobile company which requested us to complete the new design door handle production parts in a short lead time to move the whole car project forwards. We finished the mold making in 17 days and got success at the first mold trail. With our effort to make quality injection molded parts, the customer can go into a series of product testing in time. We are glad that we can help the customer saving well enough time for the subsequent production. 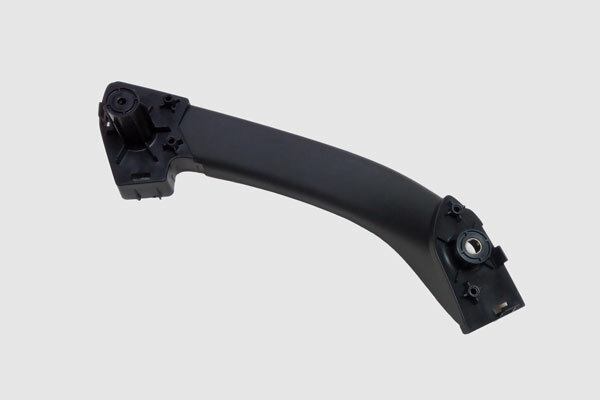 Considering the door handle will be assembly with other components as a part of the car body, we have set kinds of post finishing on the mold including EDM, WEDM, Polish, and Texture to meet the appearance design requests. It’s worth to mentioning that wire EDM (WEDM) is the best suited for those parts with intricate tolerance request which generally will be used in aerospace industry or medical industry. This door handle is a metal insert over-molding part; it would be connect to other part of the car door in next process. The metal insert was milled by CNC in advance, and then it was injected into the molding tool. When PC+ABS was melted and inject into the mold, they merged perfectly. It’s the good way to hold the metal insert and plastic material together physically.